Today's Draw: Re Birth from the Healing Energy Cards. Do you do New Year's resolutions? What are you looking forward to in the new year? Will you be using the powers of the new moon to assist your process of ringing out the old and ringing in the new? 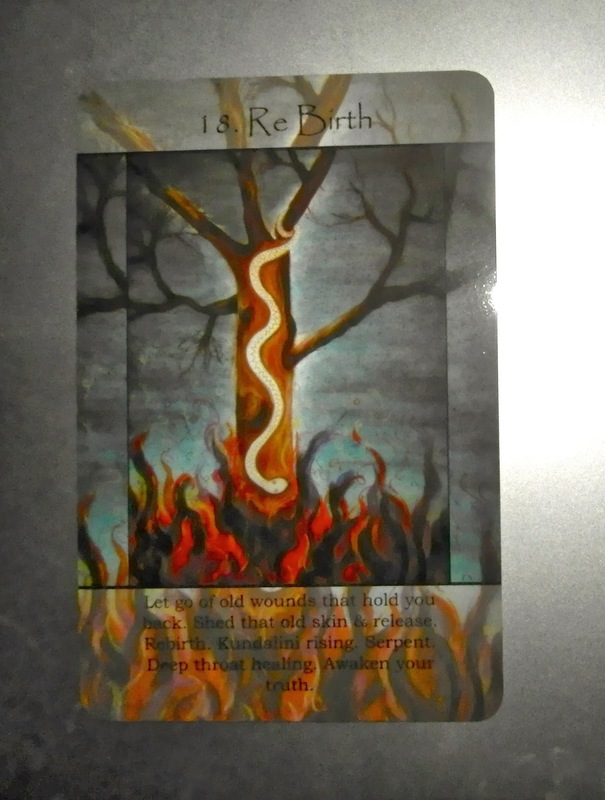 The description on the card reads (in part), "Let go of old wounds that hold you back....Awaken your truth." Could there possibly BE a more appropriate draw for New Year's Eve? In the past year I had three things I would call betrayals happen...friends who either lied to me about something important, told lies about me about something important or dumped me because I wouldn't bend to their will about something important to me. I don't know why I linger over stuff like this. Intellectually I know that this is their issue and not mine and I should be well rid of them. But emotionally it hurts. But it's not enough to do just that. You have to examine why that betrayal came into your life. For me, I had to look at the ways I lie to myself or refuse myself things that are important to me. I have to understand what these "friends" were mirroring back to me. Stuff like this doesn't happen in a vacuum. I would never do the things they did to me to anyone else. But, upon inspection, it turns out I would do it to myself. New Year's night is a new moon or a dark moon or "no moon". In earth-based religions, new moons hold the ideal energy for releasing things. It's like the last light of the moon draws things out of your life energetically, then the fulling moon draws new things in. So I'll be using that energy to reaffirm my release of the baggage of betrayal that I've been carrying this year. I find it quite auspicious and powerful that it occurs on New Year's Day because I believe that you have to release something in order to bring something new in. Like if you want to resolve to lose weight in the new year, there is some sort of behavior that must be released to allow that to happen...the over-eating, the lack of exercise or whatever. Every new minute and every new day brings the opportunity to be reborn. But the new year brings a new minute, new day, new month and new year, making it a great time for a fresh start. What do you hope to release this year? And what will you begin anew?